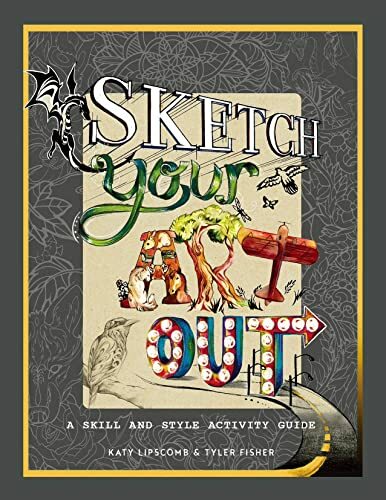 Sketch Your Art Out is a fun and accessible activity-based drawing book from Katy Lipscomb and Tyler Fisher. The design of the book is interesting. The hardcovers are cardboards and the spine is exposed to reveal the stitching. You can open the book completely flat which makes it easy to draw on because there are blank pages included for you to do so. The book's about sketching. It's designed for beginners and young artists, so you don't need any experience with drawing to get started. The book wants to help you develop the love for sketching. You can learn to draw with various media like graphite, coloured pencils, pen and ink. There are ideas on what you can sketch, basic techniques for drawing, how to share or sell your art, how to get out of a creative block and more. The pages are filled with suggestions, exercises that you can easily follow. The art fundamentals taught in this book is quite basic, so don't expect a book that really goes in depth into the techniques. It's really a casual book to get you started with drawing, to have some fun and to explore your creativity.